Hello From Long Lane Honey Bee Farms! We are David & Sheri Burns and we are passionate about beekeeping. We started out keeping bees as a hobby and the hobby went wild. For us, beekeeping is a blast. 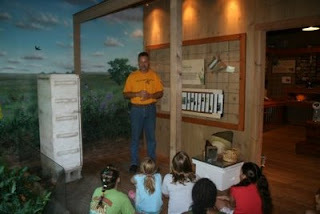 If you are not a beekeeper, we hope you'll peruse through our beekeeping lessons and consider becoming a beekeeper. If you are considering becoming a beekeeper next year, then now is the time to prepare. It may seem like a ways off, but not really. This will give plenty of time for first time beekeepers to study our lessons, purchase equipment and decide on the best location for the placement of your hives. So, my nose is glue in books every spare moment I have. My head is spinning with bee knowledge. http://twitter.com/longlanehoney So you can follow us as we tweet and we now are on facebook too. LESSON 56: COMMON QUESTIONS ADDRESSED We receive so many questions from beekeepers around the world. I decided to use recent questions as this lesson. Hopefully my answers will help you as a beekeeper, afterall we all have the same kinds of questions, don't we. And I've just thrown in random beekeeping pictures for your enjoyment. Q... When I observed my queen moving around, I noticed she just walks around a lot and does not continuously lay eggs. Even when I think she lays an egg after looking into a cell, her abdomen does not fully immerse into the cell but she just places her abdomen at the top of the cell and she does a wiggle and goes away. I also thought that the queen measures the cell with her hind legs and then lays but I noticed she was going in head first. I do not understand what she is doing. Is this a common behavior? A... Thanks for your questions. Let me correct you. Queens measure cells with the front legs, that's why we always hold the back legs when marking queens. If a front leg breaks off, then she will only be a drone layer. She does look head first into a cell and then moves slightly forward and rotates her abdomen into the cell to lay an egg. Sounds to me like you might have a virgin queen or a newly mated queen or a mated queen that has just been released from her cage. Give her a week and see if she doesn't work more efficiently. A... Hi Herman Hi Herman, I agree with the experienced beekeeper IF the screen bottom boards do not have some sort of shielding around them to break the wind. But, I have found the open bottom to be very helpful for getting rid of excessive winter condensation moisture from the hive.I just have mine sitting on pallets. A... Thanks Mark for your kind comments. Carniolans are the bee of choice for us. However, we also concentrate more on characteristics than race. We open air mate our queens as well in a somewhat controlled area. So the queens that we raise do tend to show more Carniolan characteristics. We also purchase Carniolan breeder queens that we graft from. A... Thanks Dan! Nice to meet you! A... Hi Larry, I exclusively use the California Mini Cage that is made by Koehnen. http://www.koehnen.com/cmq.html I have the best all around success in the following areas with this cage: --Transportation --Protection against mandibles of bees that are initially unaccepting. --Ability for bees to feed queen through the cage. --Ease of inserting candy plug. --Smaller size fits easily between frames. We are rotating queens through about 50 mating stations. So I am able to produce about 15 acceptable queens per week. I try not to bank virgin or mated queens unless I have to. It is better to bank layers than virgins. Virgins banked longer than 3 weeks will be no good. Virgin queens are tough to be accepted, so we place capped queen cells into queenless mating stations, let them prove they can lay well for a few weeks, evaluate their daughters and sell. I have been beekeeping for 5 years and this year is the first year I have ever extracted honey from my bees. I'm so excited! Today I peeked in my 5 gallon bucket to see how the bubbles were rising and it smelled a little like beer. I'm concerned its fermenting. All the frames were capped, 100% of them, my equipment was dry too, is this aroma normal? and if not what do I do? A... It might be normal, but then again, normally honey doesn't smell as if it is fermenting. Sometimes, capped honey can still have too high of a moisture level. I recommend always using a refractometer to take samples. I keep my honey room below 39% humidity and I always air out my sealed honey for several days with a fan on it before I process it. If it tastes like it has fermented, then it has and is not fit to sell. A slight fermentation smell may just be that the bubbles have risen to the top and the honey below is fine. See if you can taste the honey atleast a few inches below the surface. A... Sorry Marcy, all so out. Packages must be purchased very early in the year. Always call your package bee orders in as soon as you can in January or February, March at the very latest. Q... Hi David, I'm just starting in beekeeping in New Zealand, purchased two occupied hives from retiring beekeeper and I've found your online lessons fantastic .. I really appreciate not just the what to do, but also the information about why to do it that you have put in them. One thing I'm trying to work out is to do with inspections. It seems like I need a sunny, wind free day and a temperature really needs to be above 60F, and that ideally I should do this every couple of weeks.. but of course it is the middle of winter here, and that means the temperature typically won't get above 50F. I guess beekeepers are always having to compromise on this sort of thing. Do you have any recommendations on a winter inspection programme? Thanks again for all the wonderful insights from your lessons. But basically, wait until the warmest day possible, maybe upper 30s or 40s (f) or 50s is better, and just briefly open up the hive to peek and make sure there is plenty of stored honey next to the cluster. Do not lift out frames with bees. You can move frames of stored honey if you want to, but remember some bees might fly out and let you know they are not happy about you opening up their hive. They may also die from the cold as well. So work fast. 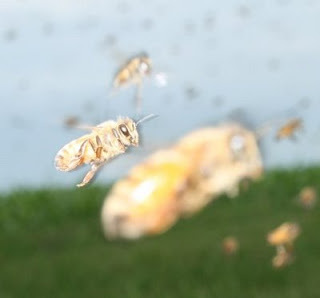 I just read your lesson on swarms and I have to say I am impressed. I am a new beekeeper this year and have only 3 hives (WBC because we are English). I attended a 3 month course before starting and I gained more from your lesson than on the course. Keep it up, the bees need you. 1. In one of your lessons you stated that a virgin queen may fly several miles to get mated or at least a long distance. If a queen breeder is advertising a certain breed of queens how can he tell for sure that the queen was mated like he thinks. Let’s say that a queen breeder was advertising in a Bee magazine that he was selling pure Russian queens. How does he know that his virgin queen was fertilized by a Russian male bee if down the road a mile was a bee yard full of Italian bees?? 2. I noticed in your pictures that you use a lot of double brood chambers. Can you tell me what you are doing here? claims of purity of progeny. Now, you can do a lot to control purity even in open air mating. control it quite nicely, but we would never make a claim of purity. Q...David, Hope things are going well with you & your family. I know you are busy, but I have a question. I installed my package on 5/1/09 when they arrived. About how long should it take for a package to draw out enough comb to add a second deep? I check my bees every 2 weeks like you suggested, and they have drawn out about 5-6 frames. Is it normal for them to take this long? I am concerned that they may not have enough store to take them through the winter. Have any thoughts that may help me? A...Hi Tim, this is every beekeeper's concern. 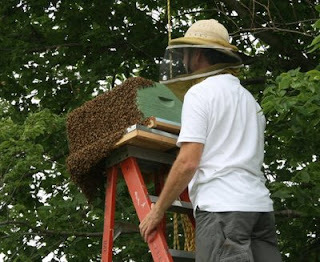 A package of bees actually drops down a little in number after they are installed, but finally once the queen becomes adjusted to the bees, the hive takes off. 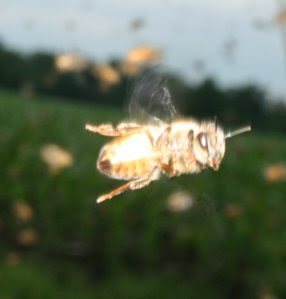 How well they do depends on several factors outside the beekeeper's control such as the weather and the nectar flow. Typically we hope a package can fill up the bottom deep in about 6 weeks, and the same on the second deep. Sometimes it is faster, and usually slower. I like to "bait" the second deep, by pulling out a few frames from the lower deep hive body with brood and bees, and place them in the upper deep next to the undrawn comb. This lures the bees to move up into my second deep. Two frames is usually plenty. 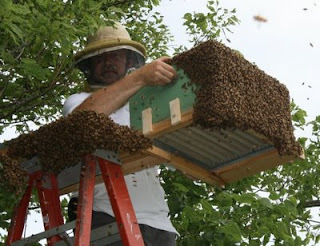 I have also noticed that we as beekeepers have much higher expectations from our bees than what is often practical. So be patient. Well, I hope you've enjoyed alittle Q&A today. Our family hopes that your beekeeping season goes well. Please keep an eye on your queens. Remember to always operate your hives with a young, prolific queen. Don't take a chance and go into winter with an old or poor laying queen. Call us if you need to replace your queen. 217-427-2678. Also, we continue to make improvement on our hive equipment that we build. If you are in need of additional hive or hive components, give us a call at 217-427-2678. We also sell all beekeeping equipment. And feel free to allow us to become your mentor in beekeeping! Until next time remember to BEE-have yourself! Hi and thank you so much...We are in our fourth week of a new hive, new keepers here, and we have 4 maybe 5 frames on one and 4 on the other with mixes of brood, honey and pollen. On inspection today we discovered a swarm cell in the bottom. We destroyed it. Should we have any concern? It's May 25 here in Virginia.